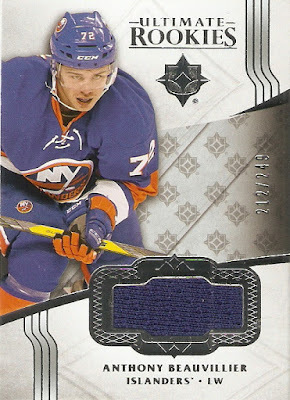 It's been a while since I picked up a box of cards from my LCS, and even longer since I got some hockey cards, but I stopped in yesterday, and got a box of 2016-17 Upper Deck Ultimate. I haven't gotten too much of this in the past, but I was feeling good about it today, so I decided to give it a try. Each box of Ultimate contains just one four-card pack. Of those four cards, there will be one base or insert, one memorabilia card, one autograph or premium relic card, and one on-card rookie autograph. The price point is a bit high for the amount of cards you get, but there are some big rewards to be had if you hit big on a top rookie or hall-of-famer. This card doesn't scan well at all, but it actually looks really cool in person. It seems to have a clear overlay on top of the card's surface, and has foil printing on the Ultimate logo and the Ultimate Introductions title, which don't show up on the scan. 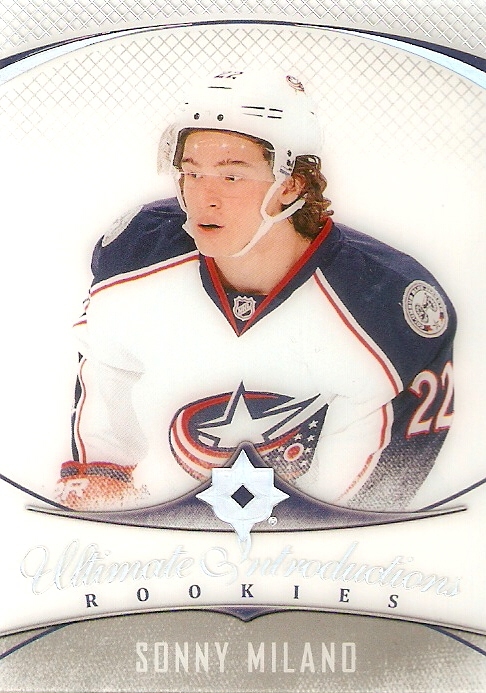 He's a player who has only played in seven NHL games in the last two seasons, but it's still a cool card to have. You'll see something very similar with the next three cards, mainly that they have the exact same design. 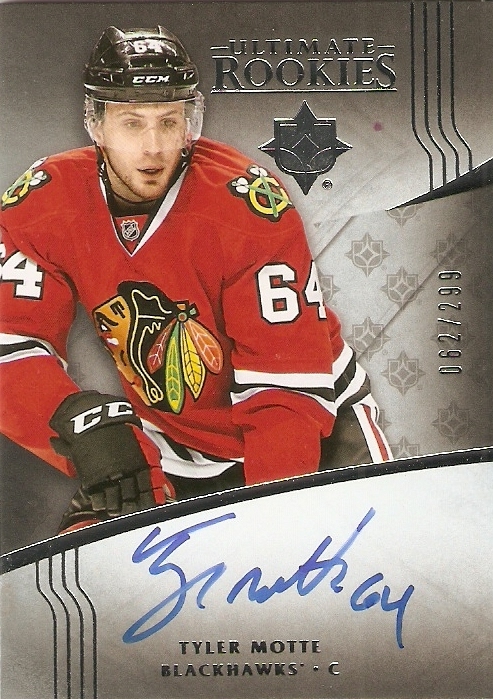 between the autograph and jersey cards, they are pretty much identical, apart from the jersey swatch or autograph. Anyway, this one is of New York Islanders left winger Anthony Beauvillier, and features a blue jersey swatch from the Islanders' home sweaters. As you can see, these are pretty much identical to the jersey cards. The only two differences, really, are the shading in the background, and of course, an autograph instead of a piece of fabric. Anyway, this one is of Tyler Motte, who split time between the NHL and AHL last season. He'll get a new chance with a new team in 2017-18, as he went to Columus along with Artemi Panarin as part of the deal that brought Brandon Saad back to Chicago. OK, so I kind of freaked out a little bit when I pulled this card. I opened up the box, and I could tell that it seemed a little bit on the thin side, as if there definitely wasn't going to be any kind of insane patch card. Knowing that, I was hoping for at least a decent autograph, and boy, did I find it. Matthews was the No. 1 overall selection in the 2016 NHL Entry Draft, and burst into the league in a big way, scoring four goals in his NHL debut! He went on to finish the season with 40 goals and 29 assists in 82 games, on the way to winning the Calder Trophy as the NHL Rookie of the Year. I may be a little swayed in my opinion of this product because if the big card that I pulled, but I think it's probably hit or miss. If it had been anyone else, I might have a different opinion, but then again, who knows what other great cards I would have found. If you have a little extra to spend, it's worth the chance, but this is definitely a high risk/high reward product. Fantastic results. Now the big question, keep, sell or grade?